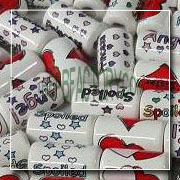 Simple words carrying the most crucial meaning helps render what your heart wishes to express at once. 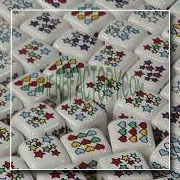 In fact, if they are created in beautiful and stunning materials, there is nothing much you require more! Whether you wish to express your blessing for a newly married couple or a lady expecting a child, we have simply the best product for you! “The Peruvian Bead Factory” specializes in offering a wide collection of the most beautiful and fashionable beads on earth in its exceptional quality and reasonable rates. 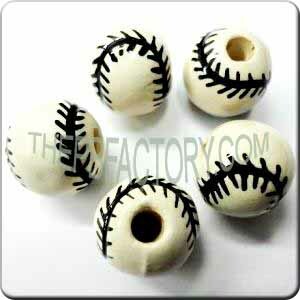 Though we specialize in various designs, our major creation are the adorable Imprinted Beads. 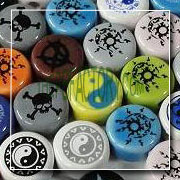 They are carefully developed with silk screen technique, where each imprint is manually colored on every side. 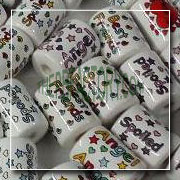 The beads are available in many shapes and sizes in the different categories. 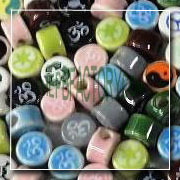 Our expert professionals are capable of creating up to seven colors imprinting in the same bead. 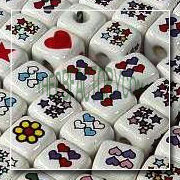 The beads are rich in details giving them a perfect balance to be used in several jewelry items. 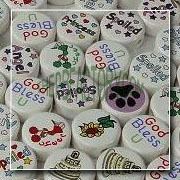 In fact, our small size imprinted beads are perfect for making an adorable set of earrings for either you or your dear ones! A few of the major imprints that are created by our experienced professionals’ are especially made for this special occasion like Mother’s day, Father’s day, Anniversary, Birthday, or just to say “I LOVE YOU”.